Photo taken at Box Canyon in the Mineral Mountains, Pinal County, Arizona. This flower was open on Aug. 3, 2008 in Rackensack Canyon, Maricopa County, Arizona, USA. FLOWERS: Bright pink to bluish snapdragon flowers. 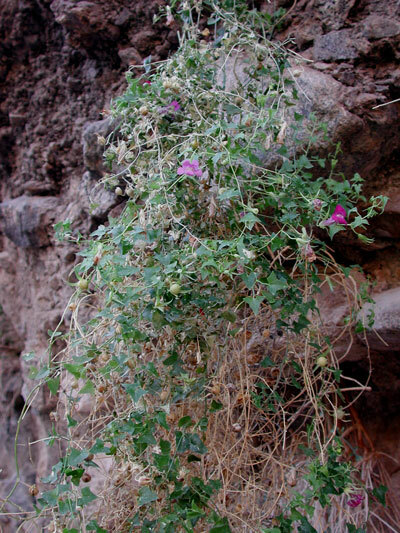 PERENNIAL HERB: Grows as a vine climbing through woody shrubs or as in the case at left hanging from a cliff face garden. LEAVES: Arrow shaped leaves are rather dark green in color. STEMS: Weakly twinning stems up to a meter long. FRUIT: Nearly sphericle capsule with many seeds. RANGE: Uncommon in the Sonoran Desert: restricted to canyons here and there where there is adequate water and some partial shade. 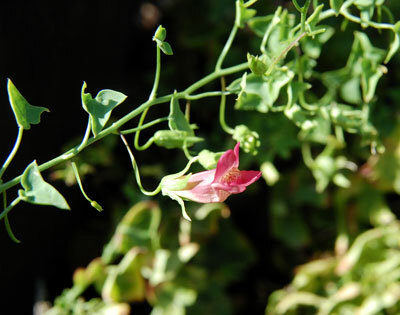 This plant is also under cultivation with a number of variously colored cultivars available. This is one of the host plants utilized by the caterpillar of the Common Buckeye Butterfly (Junonia coenia).